Alpha Performance Intercooler - Street Series - Dezod Motorsports Inc - Home of the automotive performance enthusiast since 2002. 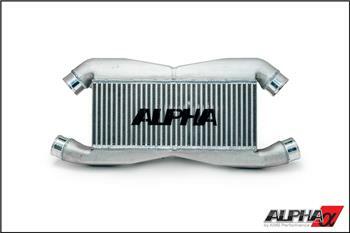 The Alpha Performance Street Series Intercooler is one of the best performing and best looking intercooler upgrades you can buy. This direct bolt-on intercooler has more internal flow area than its stock counterpart, works with stock piping and does not require any cutting or trimming! This intercooler bolts on so nice and clean you would swear it was an OEM piece!! The Street Series features cast aluminum end tanks for added durability with extremely smooth features and geometry. Designed by our engineering team using Solidworks 3D CAD software, these A356 T6 aluminum end tanks have improved flow over sheet metal end tanks and include integrated OEM location mounting points for ease of installation. Custom, precisely molded, silicone couplers provide perfect fitment and are included to optimize airflow volume and velocity as they feed through the larger 3” inlet and outlet ports. Let the competition know you mean business! Another design feature of our intercooler is one piece construction, which offers greater efficiency than the stock-style two piece designs found with some of the competition. In addition, our one piece design is more aesthetically pleasing and incorporates the infamous AMS logo on the front of your supercar – showing the world that stock is boring! AMS goes beyond our competition to ensure quality; each Alpha Intercooler is hand TIG welded in a jig for a perfect fit and pressure tested to 50 psi to ensure maximum performance. These are details often overlooked by the competition. Bar and plate intercooler core, the best performing on the market!